Honda has a new presence in its line-up for 2018: the CB300R. 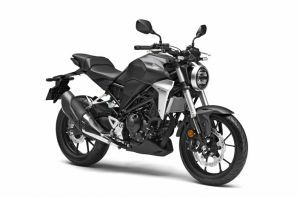 Part of a new ‘sport naked’ family – which includes the CB1000R and CB125R – it distills all of the excitement of two wheels into a distinctively-styled, lightweight form. Fun to ride, a joy to own and representing a bold new direction for smaller displacement machines, the CB300R has many of the premium features found on its larger capacity siblings. It also injects a fresh new style on to Europe’s city streets, with its ‘Neo Sports Café’ minimalist, bare-boned attitude shared with both its 1000 and 125cc stablemates. Styling is a deliberate reduction, putting the machine’s blacked-out hardware on display. It’s also brutally neat and brings a new hard-edged attitude to the naked bike scene. The cutaway tail unit is barely there, and supports separate rider and pillion seats plus the nylon rear mudguard mount. Both rider and pillion footpeg hangers are aluminium.